Travellers who want to peep into the life of erstwhile rulers should visit the Maharaja Fateh Singh Museum on their holiday to Gujarat. The museum occupies some portion of the esteemed Laxmi Vilas Palace, which was once the official residence of the Gaekwad family of Gujarat. Previously the building of this museum was built as a school for the children of the Maharaja. 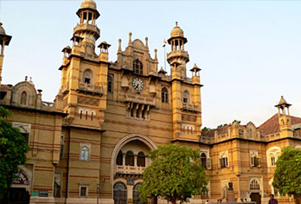 This beautiful building of the palace is a reflection of the Indo-Saracenic architecture style that still houses personal belongings of the Gaekwad family. In the museum, one can see the incredible collection of the Gaekwad dynasty and visual arts of the famous artists like Raja Ravi Varma, Raphael, Titian, and Murillo. On display in the museum are exclusive marble collection from the countries like Europe, Japan, and China. Paintings made by Raja Ravi Varma depicting the royal family of Gaekwar are the highlights of the museum. Raja Ravi Verma was also famous for his paintings based on Hindu mythology. Along with the family portraits, there is a collection of European paintings made by eminent artists like Raphael, Titian and Murillo. Other than the paintings, there is a rich collection of marble and bronze sculptures. Maharaja Fateh Singh Museum houses a rich visual art collection of the celebrated Italian artist, Fellicci. One can see the Fellicci's work adorned not only in the interiors but also in the manicured Sayaji Garden or Kamati Baug. The Oriental Gallery is a part of the Maharaja Fateh Singh Museum, where one can see artifacts from Japan and China. One can also see prized possessions of the royals that were gifted during the visit to these countries. The museum reflects the grandeur and lavish lifestyle of the Gaekwad family. Attractions: Japanese and Chinese sculptures, European paintings, Indian & Western miniature paintings, Greco-Roman artifacts, Chinese and Japanese artifacts, life portraits of the royal family itself.